You grow up hearing that, if you brush and floss daily, you can maintain healthy teeth and gums. But in the real world, it isn’t always that simple. Sometimes the gums become red and tender, exhibiting the classic signs of gingivitis. Where do you go from here? Your dentist will probably recommend root planing and scaling as the next treatment option. Root planing and scaling is a common general dentistry technique for fighting gum disease. At Signature Smiles, our team is experienced in performing root planing and scaling procedures for our Woodinville patients. But what exactly is it, and how does it help? Also known as a deep cleaning, root planing and scaling is a procedure that brings your gums back to good health. If daily dental hygiene practices and routine dental cleanings are no longer proving effective in fighting gum disease, then this is the next line of defense. Anesthesia: Because your dentist will be working below the gum line to clear away hard to reach plaque and tartar deposits, he or she may administer a local numbing agent to prevent discomfort. Scaling: During the scaling portion of the procedure, your dentist will remove plaque and tartar on your teeth above and below your gum line. In order to do this effectively, the dentist may use a number of tools, including a state-of-the-art ultrasonic tool to break up small deposits that could be causing problems and contributing to gum inflammation and gingivitis. Root Planing: Once your dentist has cleared away existing plaque and tartar, he will discourage bacteria from returning by polishing and smoothing away grooves and crevices on the surface of your tooth roots. By creating this smoother plane, the dentist gives potentially harmful bacteria fewer areas on your tooth surface to take hold and thrive. In addition to halting the progress of gingivitis or the more serious and advanced periodontal disease, root planing and scaling also offers peripheral benefits. 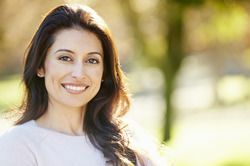 By removing built up bacteria hiding beneath the gum line, the procedure also leads to better looking gums and better breath, which all makes for a more confident you. To maintain the results of the root planing and scaling procedure, brush your teeth twice a day and floss daily. If you feel like you are having issues with the onset of gum disease, don’t wait to contact your dentist. At Signature Smiles, our family dentistry team is ready with a warm and inviting office atmosphere, in addition to the tools and the knowledge to correct any issue that comes your way. Contact Signature Smiles at our dental office today to schedule a consultation and find out if root planing and scaling could be the right next step for you.